Archives for August 2010 | Your Health. Your Lifestyle. Grape-seed bioflavonoids and vitamin C work together to provide antioxidant activity over a longer period of time for better protective results than would be predicted from the sum of their individual effects. state-of-the-art approach makes it possible—through bilayer tableting—to visually highlight definite layers and bring previously distinct products together in one formula. This opens the door to accelerated innovation in supplement design and manufacturing. Proudly, USANA is one of few supplement companies to use Nutritional Hybrid Technology. Proflavanol C100: What Makes It Work? • A daily dose (two tablets) of this innovative combination contains 200 mg of grape-seed extract and 600 mg of high-potency vitamin C per day. Proflavanol C100: What Makes It Better? • Nutritional Hybrid Technology simplifies your routine by combining two powerful supplements into one. • Potency Guarantee means you are taking the highest quality supplement possible. • Delicious, new grape flavor. Coronary heart disease includes angina, heart attacks, and cardiac arrest. Many nutrients have been shown to reduce these, including vitamin E, alpha-linolenic acid, folic acid, vitamins C, B6 and B12, unsaturated fats, fruit and vegetables, dietary fiber, whole grains, nuts, alcohol, fish oils and magnesium. Even today in the twenty-first century, heart disease statistics are frightening: In a study performed in the UK in 1991, 48% of everyone who had a heart attack died within 30 days. Half of those who died had NO prior symptoms – the first warning that they had heart disease was the last! Sadly, this is especially the case when young people have a heart attack. If half of heart attacks are fatal, then waiting until one develops symptoms is much too late for many people. Prevention, therefore, is essential, and good nutrition is a very powerful part of prevention. Some of the reductions are truly remarkable. These results suggest that relatively simple and inexpensive changes in nutrient intake can dramatically reduce the risk of coronary heart disease, which continues to kill almost one third of the populations of most Western countries. Sudden unexpected death (cardiac arrest) is very common with heart disease. Many of us have friends, colleagues and even family members who simply dropped dead and who never had the opportunity to reach the high-tech facilities in our hospitals which may have saved them. Because of these horrifying figures prevention is far more effective than waiting until symptoms appear and then starting treatment. •	Women in the Nurses Study who took vitamin E for short periods shoed almost no benefits; however, when they took it for more than 2 years, the risk of coronary disease was reduced by 41%. •	The USA Male Health Professional Study: 44,000 male doctors and other health professionals were followed for 4 years. Those men who took at least 100iu of vitamin E per day for more than 2 years had 37% less coronary artery disease. •	A study of 11,000 older people aged 67-105 years: taking vitamin E supplements reduced coronary heart disease deaths by 47%, and taking both vitamin C and E by 53%. •	Despite the negative attitude of the medical press, many doctors recommend antioxidant vitamins. USANA Vitamins Proflavanol® C100 is using innovative Nutritional Hybrid Technology to combine two of USANA’s most popular Nutritionals, Proflavanol® and Poly C®, Proflavanol® C100 packs the best of both worlds into a single, powerful pill. •	In a survey of cardiologists in the USA, 44% personally used antioxidant supplements and 37% recommended them to their patients. •	A smaller survey was taken of members of the Royal Australasian College of Physicians: 15% consumed antioxidants and 20% recommended them to their patients. However, when they developed heart disease themselves, 34% of Australasian physicians took antioxidant supplements. This is one of the few fats our bodies cannot manufacture. This is an omega 3 fatty acid found in oily fish and flax seed oils which seems to be beneficial for the optimal function of blood vessels, nerves, skin, hormones and joints. Women in the Nurse Study who had a high intake of alpha-linolenic acid had 45% fewer heart attacks than those taking only a little or none. These B vitamins help lower the blood homocysteine. High blood homocysteine level is an important risk factor for heart disease. Women in the Nurses Study who took higher doses of folic acid (greater than 700ug/day) had 31% less coronary heart disease. Those who took vitamin B6 (more than 4 mg/day) had a 33% reduction. We eat four types of fat – saturated fats (animal fats), polyunsaturated fats (vegetable and fish oils), monounsaturated (olive oil) and trans fats (mostly man-made fats). It appears that the trans fats are by far the worst, although most medical authorities recommend also reducing the amount of saturated fat eaten as well. •	Women in the Nurses Study who had high overall fat intakes did not have more heart disease. But looking at the types of fat, there was a difference. Trans fats were the worst – doubling the risk of heart disease to 200%, while saturated fat increased heart disease by 17%. Monounsaturated fat reduced heart disease by 19% and eating more polyunsaturated fat reduced it by 38%. •	Trans fat intake: the partial hydrogenation of vegetable oils to produce margarine and shortening produces trans-fatty acids. Women in the Nurses Study who had higher intakes of trans fats had more coronary heart disease. Regular users of margarines for 10 or more years had a 67% increase. Sugars which are rapidly absorbed into the blood stream cause peaks in blood glucose and insulin. These are called high glycaemic sugars, and have been blamed for obesity, diabetes, and also can aggravate heart disease. Many processed carbohydrates fall into this category: e.g. bread, white rice, sweets, cakes and cookies. •	Women in the Nurses Study who ate high glycaemic foods had more than 2 ½ times the risk of developing coronary heart disease. What are our choices for nutritional supplements? Many modern scientists believe nutritional deficiency is a major cause of today’s chronic degenerative diseases (heart attacks, heart failure, strokes, cancer, osteoporosis, arthritis, emphysema). The aging process is accelerated. For most people it is acceptable to die of a heart attack or cancer in your 90’s, but not at 40-50 years of age, something which is common in today’s world. With inadequate nutritio, our bodies degenerate faster than they should. 1. To accept this current situation. This means conceding that today’s chronic degenerative diseases and premature ageing are inevitable. 2. To find top quality food – preferably grown organically, from soils containing all the nutrients we require; food, picked at its prime and eaten before any nutrients are lost by storing or cooking. A complete selection of such foods needs to be very carefully chosen to provide all the nutrients we require. There are not many places on this planet where this is now possible. 3. To eat as well as possible but in addition take a good quality nutritional supplement. This allows the body to select the compounds and nutrients it requires, from both food and supplement. The body’s larder is complete and the cells can work optimally. When cells are replaced, all the building blocks for creating perfect new cells are available. •	Contain all the many nutrients required in the correct amount. •	Contain NO nutrients which might build up in the body and cause damage, such as iron and vitamin A. •	Be in a formulation which is easy to digest and absorb (bio-available). •	Be easy to eliminate if surplus to requirements. This means that the supplements must be carefully chosen, and few people, including health professionals, are in a position to advise on these. Many people take a range of supplements made by a number of different companies. The risk in this is that some supplements may overlap and other nutrients could be left out completely. Many supplements work synergistically, where the sum of the whole can be greater than when using individual ingredients. (For example, vitamin E is a fat- soluble antioxidant, and removes free radicals from fat in the artery walls. But it requires vitamin C and selenium to eliminate the free radicals from the body). We have to rely on the supplement manufacturers to do this for us. Much of the professional resistance to the use of dietary supplements results from the use of poor quality supplements. Consistently high quality supplements, like USANA Vitamins manufactured by USANA Health Sciences, are now available and these should make a real difference to health and recovery. Perhaps the best independent review is by scientist and ex-Canadian parliamentarian, the Hon L. McWilliam. The medical literature contains many excellent articles in peer-reviewed, top-quality journals which confirm that people who take adequate or additional doses of nutrients and supplements can greatly lower the risk of developing disease, and can aid recovery from illness. The tragedy is that medical bodies and governments take so little notice of these data – while at the same time they struggle under the enormous financial burden that disease is costing their countries. Now, if eating a good diet and taking good nutritional supplements could reduce the incidence of these diseases, most countries could save a fortune. USANA’s Digestive Enzyme supplies supplemental enzymes that support the breakdown of dietary carbohydrates (including sugars and starches), fats, and proteins. It encourages more complete digestion and absorption of nutrients while supporting the body’s natural detoxification processes. Should everybody be taking nutritional supplements? •	Should we all be taking nutritional supplements? •	Is it necessary to take additional vitamins and minerals, on top of nutrition from our food? Is it helpful or just a waste of money, ‘creating expensive urine’? •	Is there any information out there which can help you come to a decision for yourself and also your family? •	Can you help your children’s future by improving their nutrition? The body can only function properly when it has all the nutrients it needs. In today’s polluted world we need more protection, especially with antioxidants. We are also aware of the poor nutritional content of much of our food. (The UN 1992 Earth Summit reported on the way intensive farming has depleted our soil and the fruit and vegetables. For example, carrots contain 75% less magnesium and tomatoes 90% less copper than 30 years ago and there are many other frightening statistics. Total minerals in the soils have plummeted: the mineral content of the soil in the past 50 years has fallen 76% in Europe and 80% in the USA. Processing our food to make it more attractive or palatable also removes many of the nutrients found in food’s natural state. For example, the removal of husks from rice and grains takes away almost all of the B vitamins. Omega 3 fish oils present people with a dilemma. Omega 3 oils have huge health benefits – from improving the baby’s brain and IQ while in the womb, to helping joints, nerves, hormones, and skin health. Studies suggest that they may reduce the incidence of cancer and heart disease and reduce sudden unexpected death (cardiac arrest). But fish also take up mercury and other toxic heavy metals from their surroundings, and mercury is toxic to the brain, nerves and other tissues. This is so important the FDA has recommended that pregnant women should eat less than one fish meal per week because of potential mercury toxicity and consequent harm to the baby. Eating low mercury fish (wild salmon, herring, sardines, trout, Pollock, flounder and sole, crab, scallops, oyster, shrimps) may reduce the risk, but taking a regular dose of omega 3 fish oil, free from mercury, is a safer way to go. Because most of the mercury (and PCBs and dioxin) are found in the flesh, the amount found in most fish oils, especially those involving a distillation process, is quite low; however, it is best to seek out fish oils made to “pharmaceutical grade”. This is especially important when high doses are being used, as in heart disease, arthritis and mental illness, and during pregnancy. Many of today’s diseases are caused or aggravated by nutritional deficiency. Improving our nutrition should not only improve but help prevent these conditions. •	We also recommend good multivitamins and multi-minerals as well as a high quality fish or flax seed oil supplement to provide the necessary omega 3 and 6 oil. By doing this the body will obtain all its nutritional requirements from both food and supplements. With a good supplement, the body can eliminate what it does not require. •	We do not recommend any supplement which contains iron or vitamin A. These materials can build up in the body and can have serious health consequences. •	Those who believe that nutritional supplements are essential and can make an enormous contribution to vibrant health, energy, well-being and recovery from disease. •	Those who believe supplements are a useless waste of money. As with most arguments, there is truth on both sides. There are some of the scientific studies suggesting the benefits of adding nutritional products to our diet. To be fair, there are also negative trials, but in almost every therapeutic endeavour there are negative studies. We can point to many negative trials with drugs which have been ignored because of the positive trials – drugs which doctors have no hesitation in recommending to patients. The fact that there are so many positive nutritional studies, involving large numbers of people, all presented in reputable peer-reviewed journals, behoves medical practitioners to look carefully at the data. Modern food – our food should contain all the nutrients our bodies require. However, poor soil and exhaustion of the soil by modern farming techniques lower the value of food grown in it. Then, early picking of fruit before its full food value has been established, the use of toxic sprays and chemicals, storing, processing and cooking – all deplete many foods of the nutrients they would have contained if they had been grown and prepared in optimal conditions. Our bodies require many minerals and vitamins which are building blocks for our billions of cells, to protect them from bacteria and other invaders, and to help our bodies recover from injury and illness. If these essential nutrients are not in our food, then our bodies will be starved and will work less efficiently. USANA Vitamins Digestive Enzyme is unique in that it contains an enzyme found in the blend called lactase. Lactase assists in the digestion of food containing lactose. In addition, USANA’s Digestive Enzyme is different from others on the market because it contains spirulina, a nutrient-rich blue-green algae “super food” that contains chlorophyll. Our bodies are made up of many trillions of cells. All of these developed from the original cell created when our father’s sperm fertilized our mother’s ovum. This one cell divides into 2, then 4, 8 and so on until a small ball of identical cells has formed. Then the cells start specializing and form the many types of cell that make up our bodies: muscle, stomach, pancreas, lung, bone, brain and so on. After 9 months we have the miracle of a new born baby. All these developments are controlled by the nucleus which contains the genes that make us unique and pass from the parent to the baby. In each nucleus is DNA, which is the blueprint or plan for our bodies. This DNA contains all the instructions – boy or girl, fair or brown hair, short or tall – everything which creates the miracle of the human body. When we are born, we should have a perfect set of brand new cells. But this process of forming new cells does not stop at birth. As our cells age or become damaged, they are removed and replaced by new cells. As the DNA instructions found in the nucleus have not changed, these new cells should be as perfect as the very first original ones, provided the body as all the raw materials to create perfect cells. Just as a builder cannot build a perfect house without wood, bricks, nails, glass and other necessary materials, our bodies cannot create a perfect cell without the necessary vitamins, minerals, proteins and fats. This is the basis of nutritional medicine. In fact the news is even better, because all our cells are programmed to have a limited life span, after which they are removed and replaced by new cells. We replace sperm and white blood cells every day, stomach cells every 2 days, colon cells every 4 days, skin cells every 3-6 weeks and bone cells every 25 years. Only the brain and nerve cells are not replaced – they are repaired. Thus every year, apart from our nerve and bone cells, all the cells in our body cells are brand new! If we feed our cells correctly, the new ones should be just as good as the very first cells we were born with. In the womb, a baby receives almost perfect nutrition, because it’s mother supplies this from the food she eats and if this is deficient, nutrients are scavenged from her own body. Once we are born, we can only get nutrition from the food we eat and the supplements we take. NOW consider an exciting possibility; if your tissues are injured by trauma, infection or disease, as these damaged cells are replaced, this damage can be rectified, and with perfect nutrition, you can create perfect replacement cells. Is it surprising that the body cells do not function optimally when they are not given all the nutrients they need? 1. Will enable the body to replace its cells with new ones which can be better than the older damaged ones and be as near perfect as possible. 2. Enables all the cells to function optimally as they were designed to do. •	Toxins – sprays, pesticides, heavy metals, fumes, smoke and preservatives. •	Free radicals are unstable damaging molecules with only one instead of paired outer electrons and they damage anything they touch. A free radical steals electrons from nearby molecules, turning them into free radicals, which causes a chain reaction of damage. A free radical is like spark: short lived but very damaging. This process is often called oxidation. Free radicals are caused by many things including stress, saturated fat in our food, sunlight, toxins, fumes, smoke, exercise and radiation. Our bodies require extra nutritional help to eliminate these toxins and poisons. For example to eliminate excess lead from the body, we need additional calcium, zinc, selenium, vitamin C, flavanoids, and chromium. To eliminate mercury we need selenium, lipoic acid, manganese, chromium, vanadium and so on. Remember, this need for nutrients is over and above our usual daily requirement. This oxidation caused by free radicals damages the cells and is the basis for the development of many diseases, including heart disease, arthritis, cancer and strokes. Antioxidants in our diet (vitamins, proanthocyanidins an minerals) are compounds which can donate electrons and can help neutralize these free radicals, thus protecting our bodies. Think about all of the greatest technological advancements through history: the wheel, the telephone, the invention of flight… After landing on the moon, it seemed as if technology couldn’t be pushed any further—until now. Join USANA and take the next step toward the future of your health. It always feels great to be the first, but USANA is currently the only company in the industry to take advantage of Nutritional Hybrid Technology (NHT). NHT is so new and groundbreaking, it’s difficult to imagine what might come next. What is Nutritional Hybrid Technology? USANA‘s innovative Nutritional Hybrid Technology is a state-of-the-art approach to formula design and manufacturing. NHT features bilayer tableting: the separation of various formula ingredients into two distinct tablet layers. Now, for the first time, incompatible ingredients can be combined in a single tablet, and key nutritional ingredients can be visually highlighted in distinct tablet layers. USANA‘s Nutritional Hybrid Technology opens the door to accelerated innovation in supplement design and manufacture, and USANA is proud to be the first in the industry to utilize it. What USANA Vitamins and USANA products use Nutritional Hybrid Technology? Replacing Proflavanol, Proflavanol 90, and Poly C, USANA’s new Hybrid pill Proflavanol® C100 will make your life a little easier by lessening the amount of pills you need to take without sacrificing any of the nutrients you need. Hepasil DTX® has also received the Hybrid treatment and is now available in MyHealthPak™. 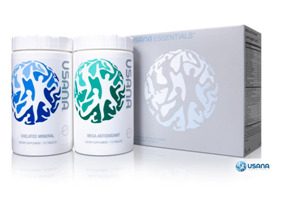 Take advantage of USANA’s pioneering efforts in the field of nutritional supplements. Add these new products to your MyHealthPak and Autoship today!